Writers, poets, painters, movie makers, philosophers, scientists, the smartest minds and the most sensitive hearts, all throughout human history, struggled to answer what is love. Countless definitions have been given, but nothing can really capture and describe the moment you look into the eyes of the person you love. Not even close. Nobody can fully explain the divine beauty, the blissful ecstasy that removes every glimpse of fear, when you kiss the lips of the person you love. Nothing can compete with this. Nothing can be greater than this moment, than the moment the person you love tells you that they love you back. Love is truly everything. We all know this deep within. People tend to give a beautiful quote that glimpses this truth. 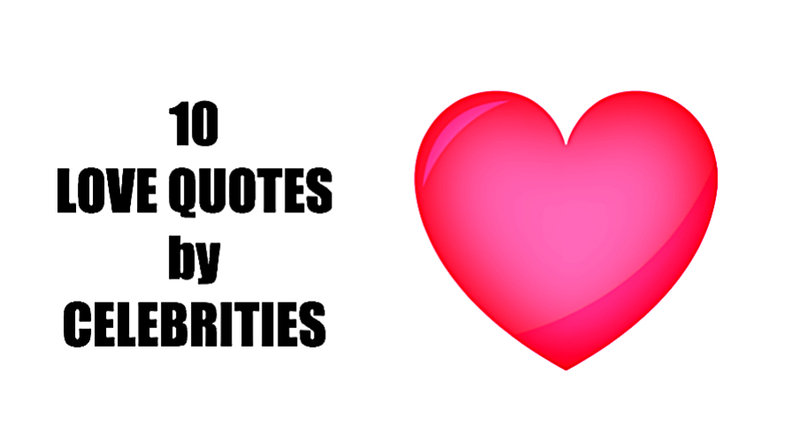 Here are the most beautiful love quotes by celebrities. 1. “Love has nothing to do with what you are expecting to get, only with what you are expecting to give, which is everything.” — Katharine Hepburn. 2. “The most important relationship in your life is the relationship you have with yourself. Because no matter what happens, you will always be with yourself.” — Diane Von Furstenberg. 3. “A simple ‘I love you’ means more than money.” — Frank Sinatra. 4. “You know its love when all you want is that person to be happy, even if you’re not part of their happiness.” — Julia Roberts. 5. “Every once in a while I can catch a glimpse of her when she doesn’t see me looking, and I have this moment where I’m like, If you only make bad decisions for the rest of your life, you made one really good decision.” —​ Justin Timberlake. 6. “The truth is, everyone is going to hurt you. You just got to find the ones worth suffering for.” — Bob Marley. 7. “There’s nothing that I wouldn’t do to make you feel my love.” — Bob Dylan. 8. “You know you’re in love when you can’t fall asleep because the reality is finally better than your dreams.” — Dr. Seuss. 9. “Love is something sent from heaven to worry the hell out of you.” — Dolly Parton. 10. “All you need is love.” — John Lennon.